VIP 2.0 is the second edition of the VIP Art Fair, an event that has made a serious mark as a leading online platform for contemporary art. The VIP Art Fair is a 100% online, with VIP 2.0 having taken place earlier this month. The event saw 160,000 visitors, from 155 countries, viewing 1.5 million website pages. Collectors and visitors to the event had to register to view the online art marketplace, and to take part in the VIP 2.0 experience. 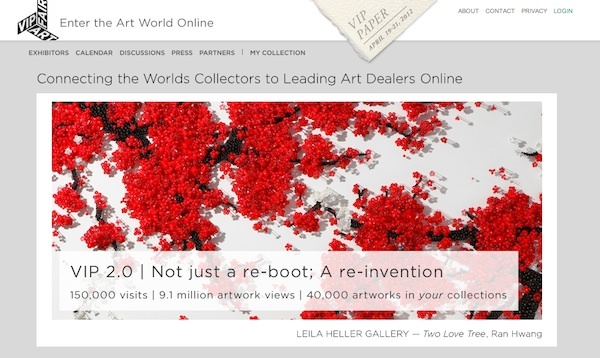 As well as allowing galleries to showcase their works in a sophisticated, fair-like manner online, the VIP Art Fair also offers an interface through which collectors can build and maintain relationships with galleries and dealers, and so producing a successful place where art can be enjoyed and purchased online. The VIP Art Fair brings together 135 galleries, from 35 countries, with 1,500 works, from 1,100 artists. The benefits of the VIP Art Fair being online, have been solidified by reports that galleries have been able to acquire new client-bases in new geographical locations, and have been able to promote their artists' work across the globe. The technical developers at the VIP Art Fair have been very clever in putting together the online engine that makes all of this possible for the galleries. VIP 2.0 saw 54 video and new media works, which were streamed on the website, 400 paintings hung in virtual gallery booths, 300 sculptures, all shown with multiple views, and perhaps most impressive of all, 78 museum-scale installation works that took advantage of the unlimited space that the internet allows. The VIP Art Fair team did an amazing job at working on the technology for the fair in the run up to VIP 2.0 and have easily shown that selling art online is incredibly viable. For VIP 2.0, they made sure to have a strong community-focus for the whole project, encouraging social media sharing and interaction between the users and galleries. For an art-hungry, internet savvy audience, the VIP Art Fair also offers a wealth of new material to get your teeth into, and figures show that people really took advantage of that. In just a matter of days, there had been around 9,050,000 artwork views, with visitors making repeat visits, and even being able to save their favourite works within their own account. The huge success of VIP 2.0 this February has meant that the VIP Art Fair has high hopes for the series of events that they are going to be holding throughout the year, including VIP Paper from 19th - 21st April, VIP Photo from 12th - 14th July, and VIP Vernissage from 20th - 22nd September. If you're interested in being part of the wave of visitors turning to the VIP Art Fair as a way to view and buy art online, then don't forget to sign up on the VIP Art Fair website.